Resting on over 14 private acres, Heroncrest was built circa 1840 and boasts scenic ocean views, gracious lawns, perennial gardens and southern exposure. Enjoy sunrises, sunsets and moonlight over picturesque Penobscot Bay in this house furnished with antiques and original art. There are 2 bathrooms: the downstairs one has a walk-in shower, the upstairs one has a charming claw foot tub. Two bedrooms upstairs have exquisite views of the water and distant islands through the dormer windows. The south facing bedroom downstairs also has water views while the other bedroom downstairs has a quiet view to the back woods. The dining room offers water views to the south. Sliding glass doors lead to a peaceful deck facing the back lawn and woods. The living room, den and upstairs playroom lend private space to all. Included are 100% cotton linens, large towels and a washer and dryer on the main floor. The well equipped kitchen is stocked with tasty coffee beans and mill, assorted teas, sugar, spices, olive oil and wine vinegar. There is even a stand of garlic right off the kitchen entry door! For the rainy days, there is internet connection, tv, dvds, and some board games. Or you can grab a book from the shelf and curl up for a good read in front of the fireplace. Up the hill behind Heroncrest is a wooded 100 acre wildlife preserve, great for snowshoeing in winter and wandering in summer. Heroncrest is within a mile of downtown Searsport’s fabulous rotunda library, antique shops, eateries and the famous Penobscot Maritime Museum. About the same distance from the house is Moosepoint State Park. On occasion, a beautiful wild orchid can be seen along the footpath there. Belfast, with its Friday night art walks, farmer’s market and seasonal festivals is 10 minutes away. 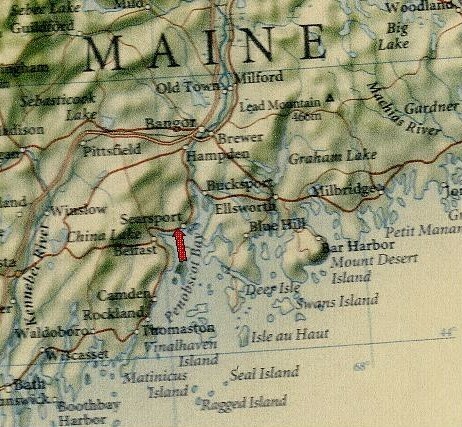 Acadia National Park and Bar Harbor are within an hour’s drive. Midcoast Maine has bus service that will take you to within a mile of the house. However, if you wish to explore all there is in the area, a car would be of the essence. There is a car safety seat, some life vests, a pack-and-play and a booster seat for the table available at the house for our young guests. We are open year round and rent nightly, weekly, monthly.